Merriam-Webster defines Prince Charming as the wonderful man who fulfills the dreams of his beloved. By any standard, every fairytale hero deserves the appellation. The ultimate goal of fairytale heroines, of course, is marriage, preferably to a wealthy (if not aristocratic) gentleman. Before one begins to fume at this traditional pigeonholing of feminine ambition, one must remember from whence these ancient tales arose. Prince Charming as a standard character appears in our favorite fairy tales: Snow White, Sleeping Beauty, Cinderella, and Rapunzel. 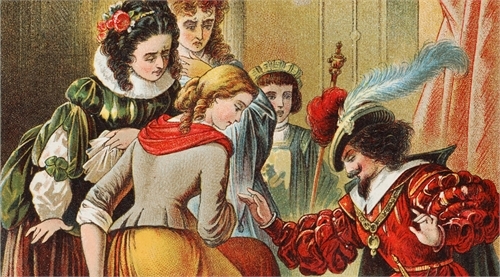 The earliest acknowledged use of the appellation “Prince Charming” (or “King Charming”) appears in The Blue Fairy Book (1889) by Andrew Lang, in which the hero’s name is “Charming.” In The Green Fairy Book (1906), Lang calls the hero “King Charming.” The trope continues in The Red Fairy Book by Lang. Feminists may balk at the Prince Charming character, particularly at the traditional role of princesses waiting to be rescued. The typical happily-ever-after (HEA) ending in which the dauntless hero wins the princess’ hand in marriage rankles, as though she were merely the prize for his heroism and not the fully fleshed out character she should be. Instead, scholars suggest that the prince is the the prize. The character traits of the traditional Prince Charming imbue masculine pulchritude, physical strength, intelligence, humor, romance, kindness, honor, and a healthy dose of swashbuckling. Idealization makes character development difficult, as any professional writer will attest, without perverting that character. When done well, the heroic prince demonstrates this combination of traits salted with bits of sardony, irreverence, and, perhaps, temper. Although the character may have his faults—and good storytelling demands that he does—he is, at heart, a good man. The character need not even be aristocratic. Classic tropes often elevate a commoner to royalty through marriage to his princess whom, of course, he rescues from distress. Such heroic deeds leading to elevated status occur in the stories of Aladdin, Ali Baba, and Sinbad and the twelve princesses who danced their shoes to pieces. Playwright Oscar Wilde’s novel The Picture of Dorian Gray (1890) twists the concept of Prince Charming as applied to the main character. Dorian Gray, whose portrait ages as he descends into decades of debauchery, treats a young actress so poorly such that she kills herself. The villain Gaston in Walt Disney Studios’ Beauty and the Beast, arose as a grotesque amalgamation of stock Prince Charming heroes: handsome, dashing, and not so charming. Even earlier, Roger Zelazny and Robert Sheckley’s fantasy novel Bring Me the Head of Prince Charming (1991) turns the trope on its head with sharp satire. The 1986 Broadway musical Into the Woods and the Fables comic book (2002 - 2015) further twist the Prince Charming archetype by turning him into a polygamous philanderer: charming, but neither sincere nor faithful. Many children and adults will be familiar with the unsavory character of Prince Charming as portrayed in DreamWorks Studios’ Shrek 2 movie. Regardless of the portrayal—straightforward or grotesque—the illusion of Prince Charming lingers as a masculine ideal to which we want our sons to aspire.